anvilfire Anvil Gallery : Images of anvils of the world. Over 500 images of over 300 blacksmiths anvils, sheetmetal stakes and miniature anvils from all over the world, American, British, Chinese, French, German, Spanish, Russian, Bulgarian, ancient and modern. Images from the Lyda-Ferdinand, Prillwitz and Greenwood blacksmiths anvil collections plus several miniature anvil collections, the anvilfire image collection and donated images from our readers. More. . . 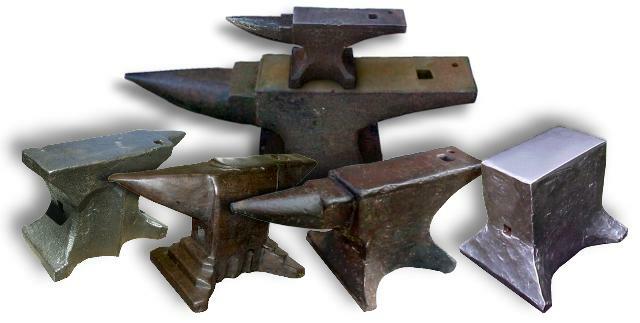 If you have local knowedge of specific styles of European anvils we need your help. 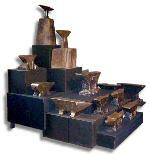 Many of our anvils are identified as being a style from specific countries or regions. Little is known about the origins of these regional styles or what they should be called. The square hardy or hardie hole in an anvil is designed to hold square shank tools, dies and swages. Tool shanks can be snug but should NEVER be tapered. A tapered shank can get stuck in the hole or even break the anvil. All but modern machined and broached hardie holes have some taper and out of squareness. Very snug fitting tools may only fit one way. I prefer tools that fit all directions and are easy to get in and out. This may require a shank with some taper for clearance. The diagonal hardy hole is a modern disaster created by foundry pattern makers looking for the easiest way to make a square hole. NEVER purchase an anvil with a diagonal hole. Selections from the extrodinary collection of Austrian tool dealer Emerald Koch. Blacksmiths Tools you may never see anywhere else in the world. Many of these rare items are for sale and will ship worldwide. Attwood Stourbridge from Australia, Stake anvil from the Turley Collection, Three Italian anvils, Russian Stake Anvil, Brooks, Columbian, Vulcan, Arm and Hammer Anvils, Fisher Eagle Anvils. . .
* NEW! * 63. Two Vulcans From the Ted Mays Collection. Collections from John Catchings the Sovie estate and MORE. Photographs of one of the finest collections in the U.S. including Colonial American and European anvils. Photographs of over two dozen rare anvils, many never seen outside Europe until now. 11. Dentists Anvil Made by Alex D. Cunny, Cin. OH. The Old Millstone Forge Museum anvils. Includes foundry patterns, rare laptop anvils, two Vanadium Steel anvils and Champion Forge Combination Six-in-One tool with anvil. Unique English or Continental stakes, another 'S' anvil and an ancient wrought iron stake. A new series by Jock Dempsey, Josh Greenwood and other contributors. Fisher-Norris Eagle, Mousehole, Hay-Budden, Peddinghaus, Grizzly, Sawyers and Cutler's anvils and more. The "other" blacksmiths "anvil". A collection of over 50 swage block images plus articles on the history, design and use of swageblocks. Over 3000 years of blocks. Another web gallery by Jock Dempsey the anvilfire guru. Another blacksmiths forming tool that is not an anvil. The Cone and Swage Block project suggested by Fred Holder of the Blacksmiths Gazette finally come to fruition. A dozen cones from a 2,000 pound solid cone to Jewelers Ring mandrels added to the growing collection of swage block images. NEW! KING and Queen of Cones. 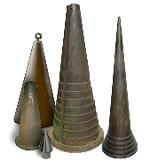 Huge Industrial sized cones. Emerald Koch Collection. Our collection of anvil articles. What type and size anvil do you need? Weight ranges, styles. Links to our other anvil articles. 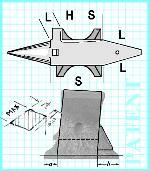 Index to our collection of Old and new anvil making articles. NEW All Steel Fabricated Anvil by 17 year old Canadian Includes CAD drawings. How to find anvils or anything else! How "finders" do it. German and Austrian Anvils Comparison of types early and modern. About Hardie Holes Updated with data table.